From Brian Greene, one of the world’s leading physicists, comes a grand tour of the universe that makes us look at reality in a completely different way. Greene uses these questions to guide us toward modern science’s new and deeper understanding of the universe. From Newton’s unchanging realm in which space and time are absolute, to Einstein’s fluid conception of spacetime, to quantum mechanics’ entangled arena where vastly distant objects can bridge their spatial separation to instantaneously coordinate their behavior or even undergo teleportation, Greene reveals our world to be very different from what common experience leads us to believe. 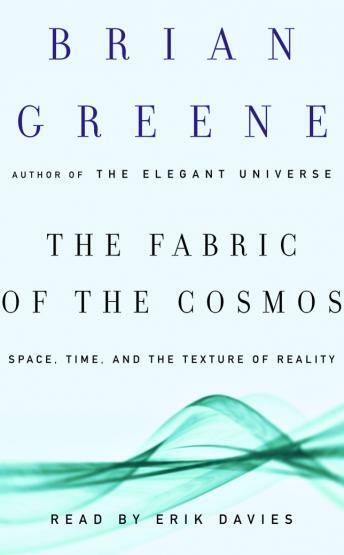 Focusing on the enigma of time, Greene establishes that nothing in the laws of physics insists that it run in any particular direction and that “time’s arrow” is a relic of the universe’s condition at the moment of the big bang. And in explaining the big bang itself, Greene shows how recent cutting-edge developments in superstring and M-theory may reconcile the behavior of everything from the smallest particle to the largest black hole. This startling vision culminates in a vibrant eleven-dimensional “multiverse,” pulsating with ever-changing textures, where space and time themselves may dissolve into subtler, more fundamental entities. Very well written and mind expanding. The narrator easily conveys the words on the page, what a journey. Very good read with straightforward examples and discussions that a non physicist can follow and appreciate the challenges faced by some of our great minds of the time. As read by Erick Davies it was if Brian Greene himself was speaking to you, with the same excitement and energy that makes you NOT want to stop listening!